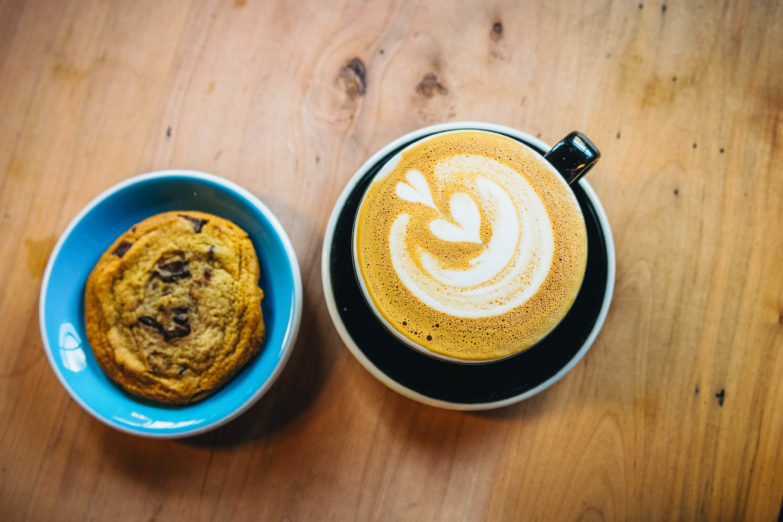 It's hard to throw a rock without hitting a coffee shop in this city, whether it's one of the big name chains or one of the hundreds of independent cafes that are scattered throughout every neighbourhood. Because of this bounty of choice, we often have a difficult time figuring out where to go to get a new experience when our regular haunt is not quite cutting it. Maybe you're just looking for something to do other than tap away on your laptop or listen to smooth jazz. 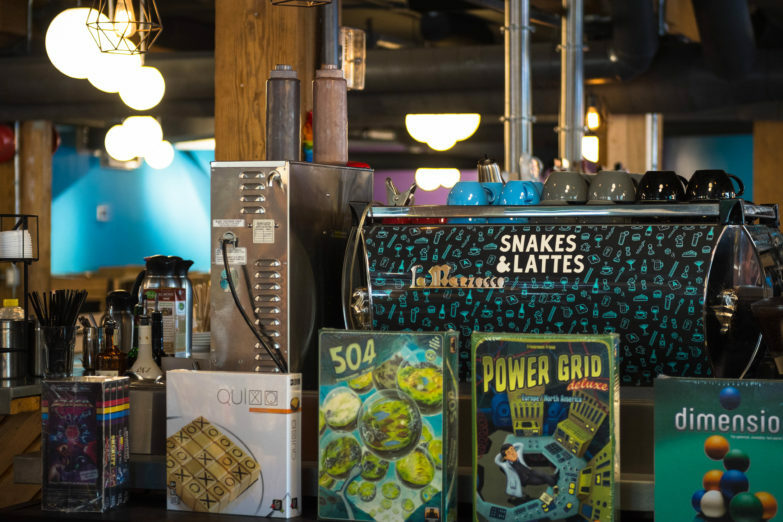 That is why we've put together 5 of Toronto's most unique coffeehouses that will give you a little something extra with that morning caffeine kick, whether it's board games or bikes or comic books. Jamie's tip: Grab some Unicorn Poop, a house-roasted Americano and take in the vintage VHS movie. 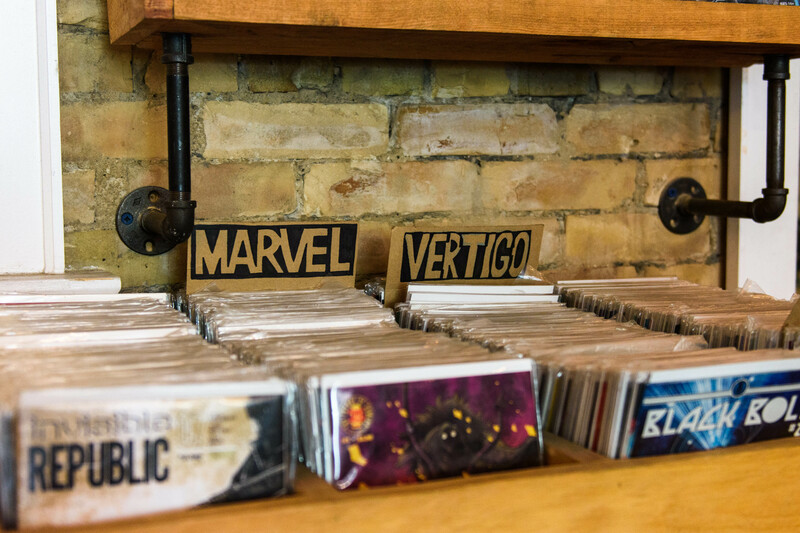 The Sidekick is the place to go in Leslieville not only for a good brew but all the indie comics you could ask for, all carefully curated by the staff. Doubling as a retail shop for all genres of comic books, TV and film paraphernalia, and art, this bright and colourful cafe is exceptionally designed to provide for all your coffee needs as well, including a large space to work on your homework or comfy corners to relax with your friends. Upon walking in, you'll be struck with the large mural painted on the western wall by the owner Chris Watton who is both a barista and artist herself. 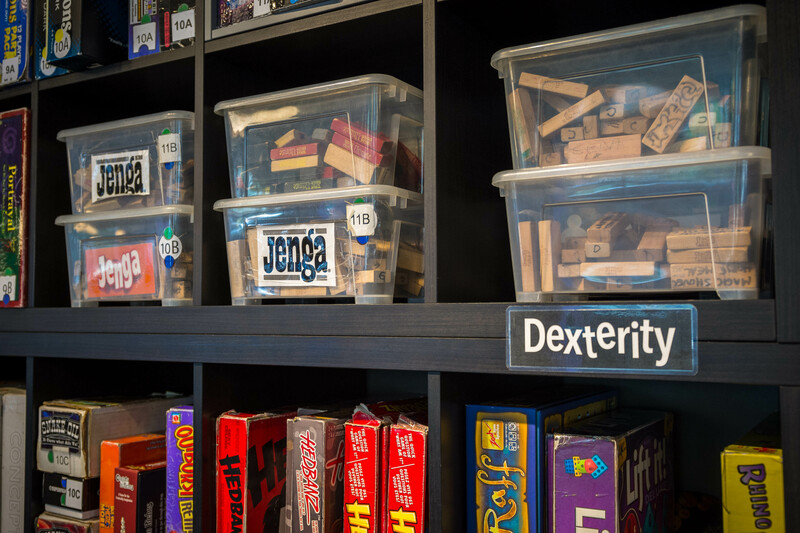 Making her dream a reality, she saved up and created a place that isn't only welcoming to nerds & geeks alike, but everybody else from soccer moms to business men. If you've ever wanted to get out of your place and curl up with a frothy cappuccino and a new comic book in large armchair, you can't go wrong here. 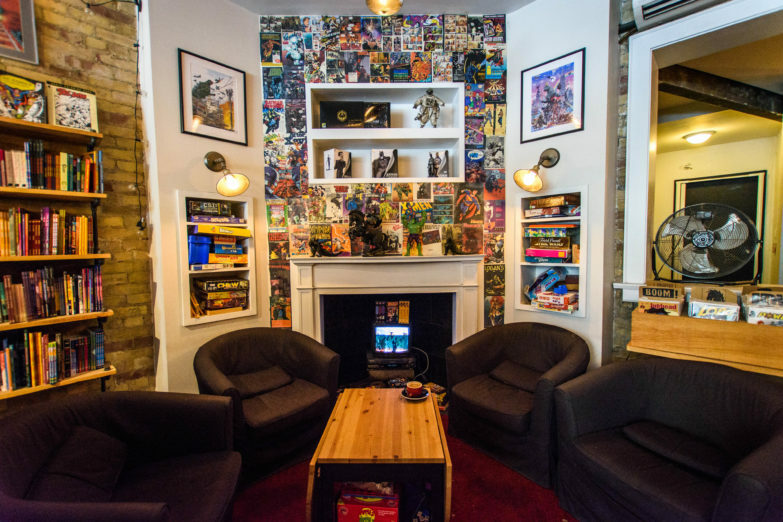 Hitting a wonderful playful and tasteful balance in decor, the fireplace corner is wallpapered with old comics as one of many 80s or 90s VHS movies play on a tiny tube TV. In the back is a bean roaster and in the front are bags of The Sidekick's own roasts for take-home sale. 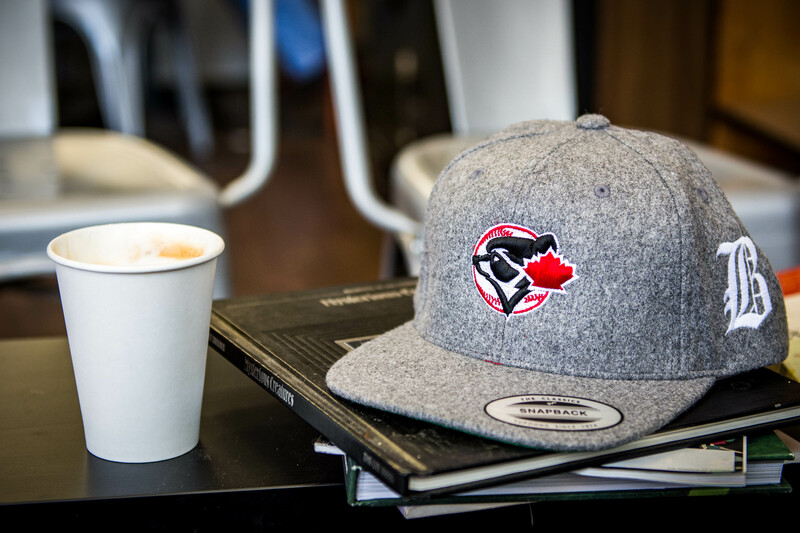 Not to mention, if you want to walk around town showing your pride for your local java spot, they've got merch too. It's a spot that has definitely been missing in the east end of Queen. 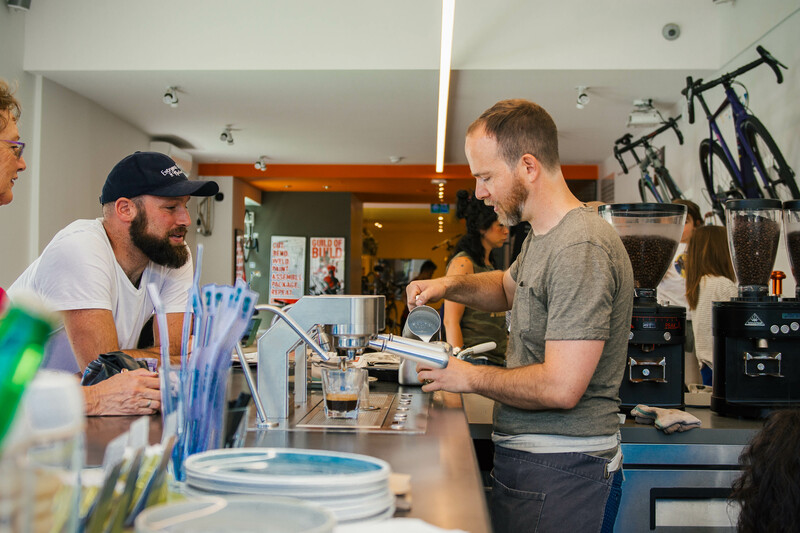 After three years, it looks like it's thankfully here to stay because as Chris recounted, it's become a staple of the neighbourhood. Jamie's tip: Try the Nutella Latte and bring your friends! 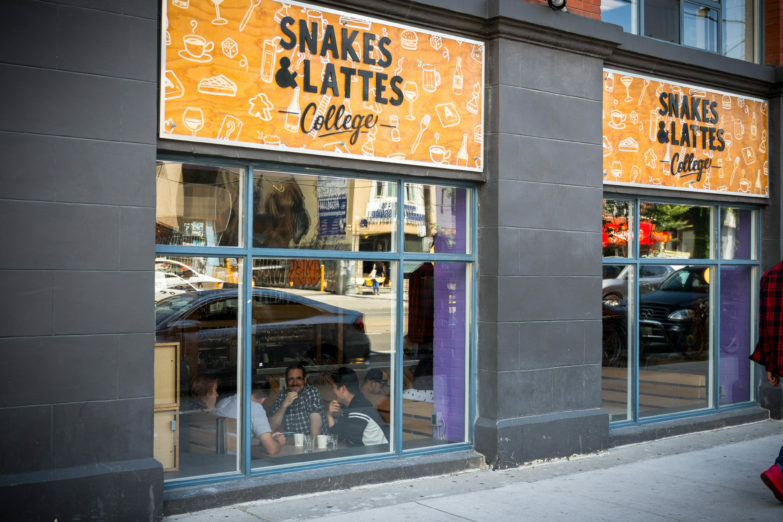 You'd be hard pressed to find anybody who's been to university in Toronto that hasn't heard of this cafe. 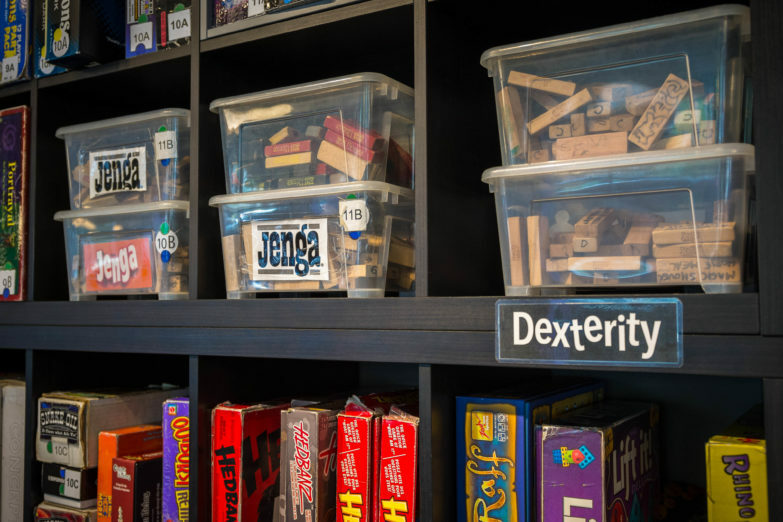 The flagship location is up on Bloor and has been for 8 years providing the ability to drink a cuppa, snack on some munchies, and play board games as long as you like for a small fee. 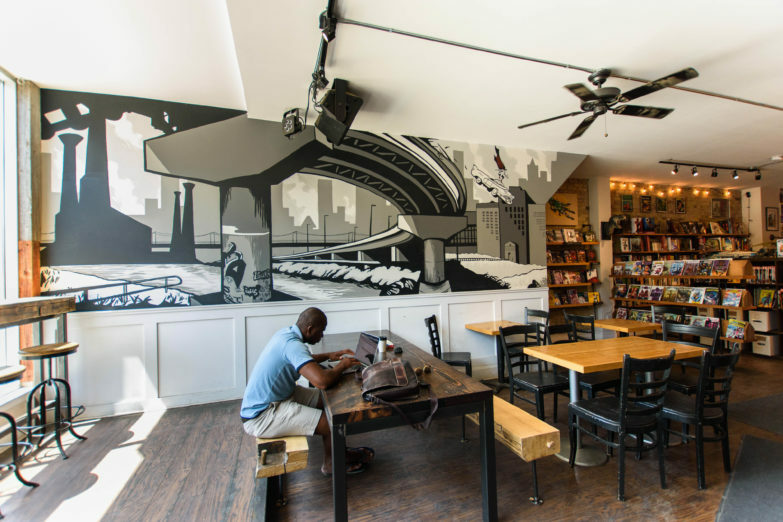 It's always been one of those special sorts of hangout spots, especially for young people who just want an alternative to the saturated college bar scene. The location on College opened 3 years ago, taking over the space that many students have spent a fondly remembered hard-partying night or two—Andy Poolhall. It's a huge space, with over 1000 board games to choose from as well as something the Annex location originally lacked (but has now): a bar. They've got a wide selection of beers, ciders, and some wine on tap as well as a functional liquor bar for some signature cocktails. All of this comes with a fully-fledged food menu all day long. 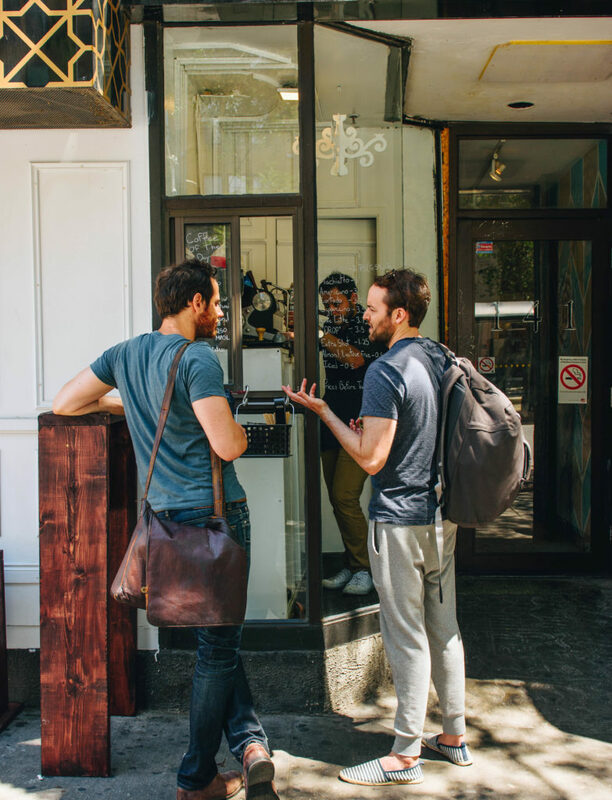 Yes, you can just walk in grab a quick drip coffee and go, but that doesn't seem to be the norm. When people come here, it's to spend time and enjoy a seriously delicious, creamy and sweet Nutella latte. 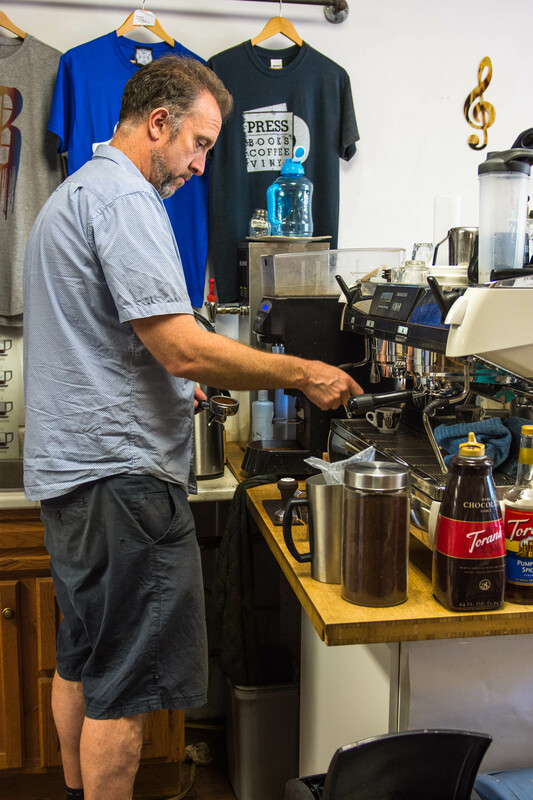 How can you really go wrong with a specialty latte when it's in their name? Of course, there's no reason you can't pull out your laptop, order a plate of nachos, a boozy Irish coffee and work on that manuscript you've been putting off either. 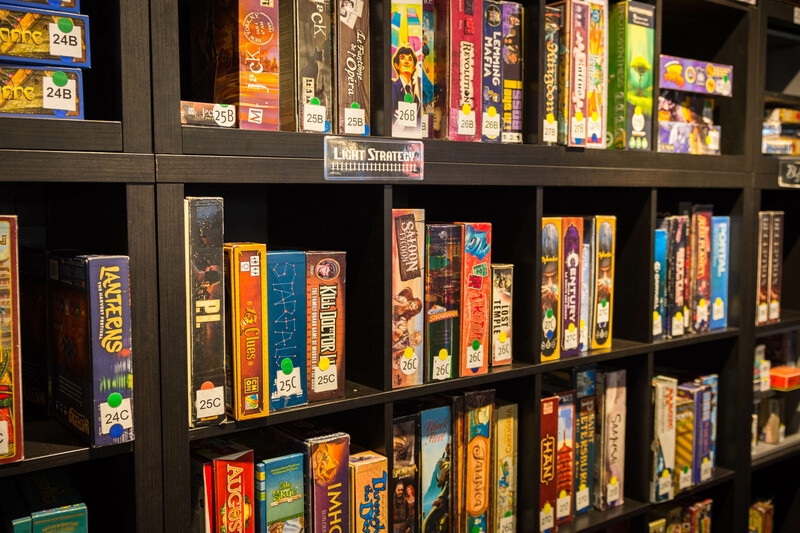 So, it's not just coffee, it's not just board games, it's not just booze, it's not just food, and it's not just a retail shop. It's all five in one! Jamie's tip: Definitely sample the cappuccino. 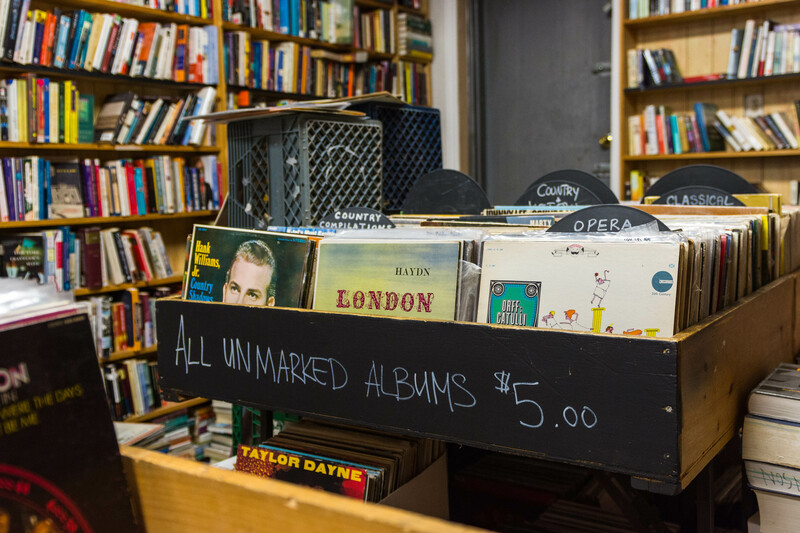 You need it in your life, and pick up a used paperback or classic rock record for your dad. Once upon a time, this space was occupied by a less than nice used book and record shop. 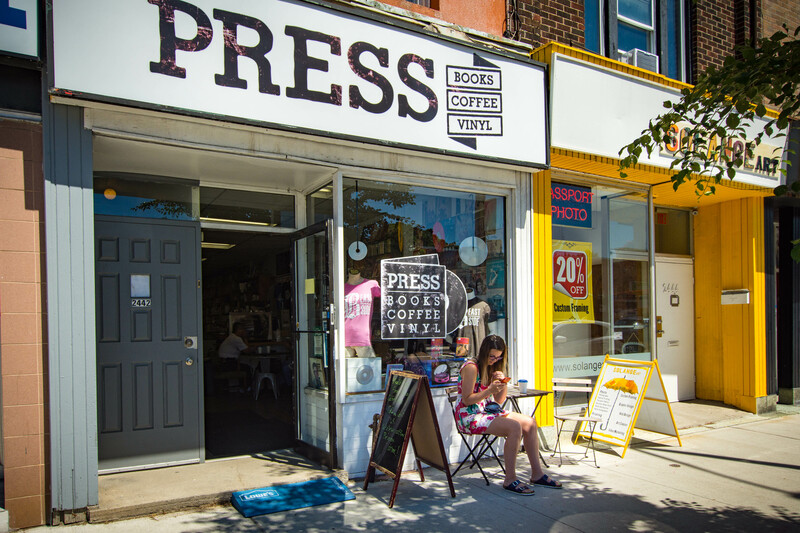 While Press didn't follow that same path exactly, it has reinvented the same wheel in a way that makes it one of the bet additions to East York in quite some time. 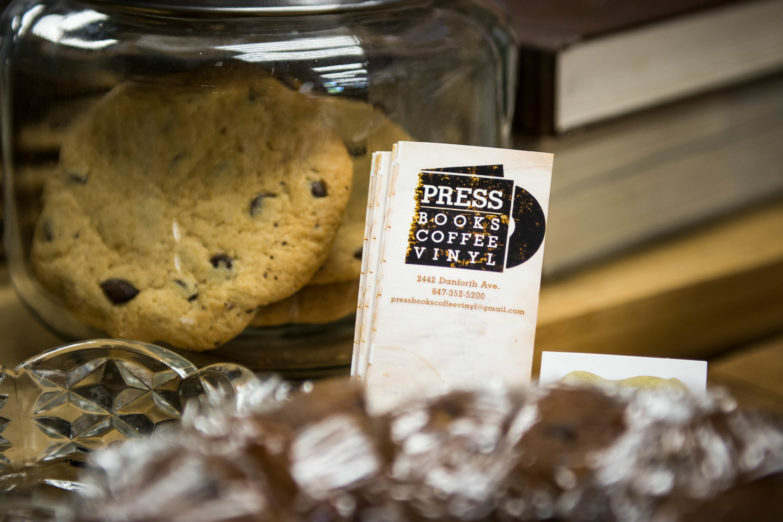 It's part used vinyl, part used books, part local streetwear vendor, and part delicious coffee. The beans here come from the Toronto-famous Reunion Island roasters but it can be said that whatever owner-barista Damon Scheffer does to conjure the cappuccino outperforms the baristas in its namesake cafe. Frankly, it's delectably smooth, perfect foam, and the perfect balance of milk and java. 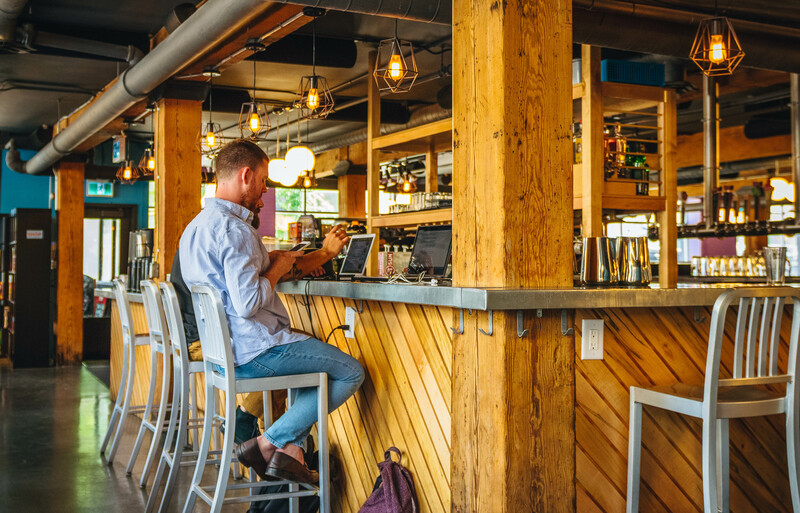 If you're looking for one of the many sparse and modern "workstation" types of coffee spots to hunker down and plug away in front of a screen, you may be out of luck here. It's simply not meant to be that sort of cafe. 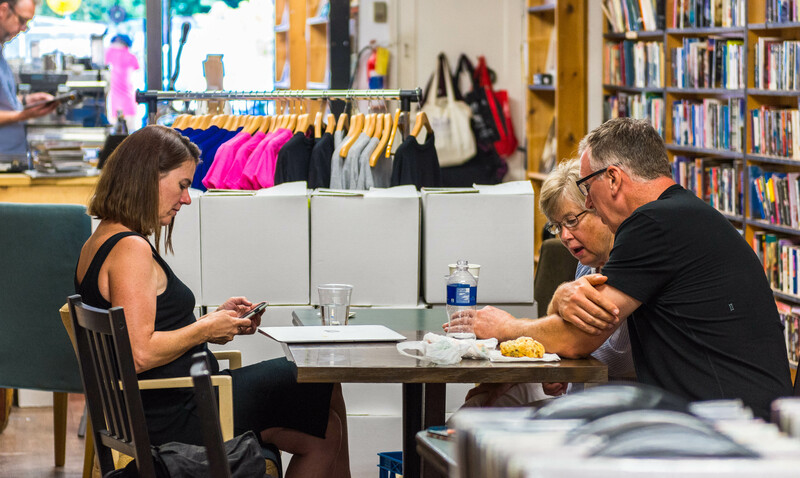 It's cozy and friendly, a place for locals to hang out and chat or read. There's even a table for children to colour and read the selection of books for them. The front section is dedicated to coffee with comfortable seating and the coffee bar. 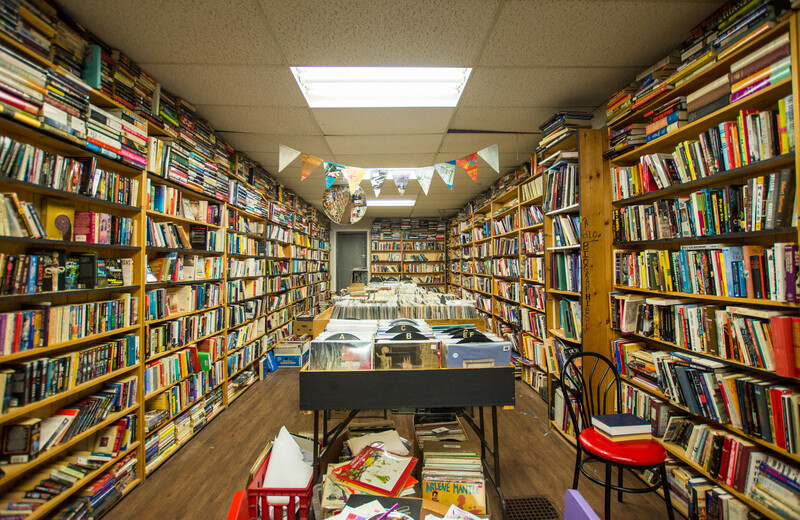 Further into the shop you'll see walls lined with the best-priced used books you're likely to find in the city. 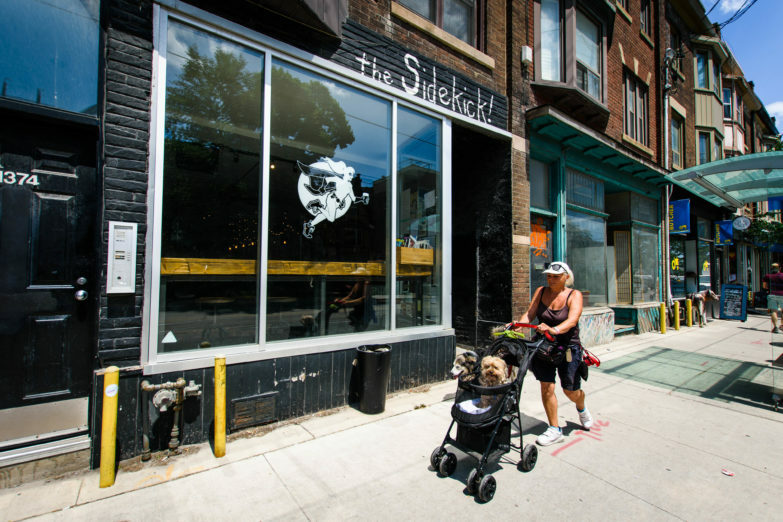 Running down the centre is more table seating as well as a special clothing section that features local East York streetwear brand Beast York. There are also bins and bins of classic vinyl if music is more your thing. 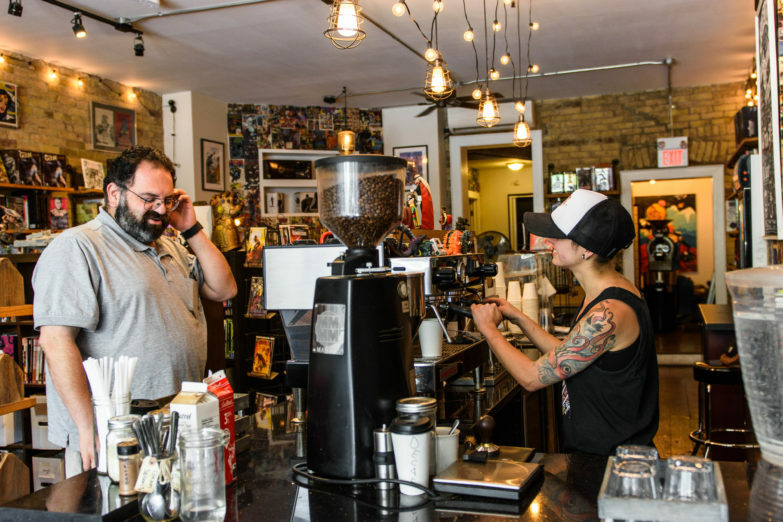 This area of the east end is slowly working its way into the general city-wide consciousness as a place to actually visit and live and it's places like Press that are helping that forward momentum. 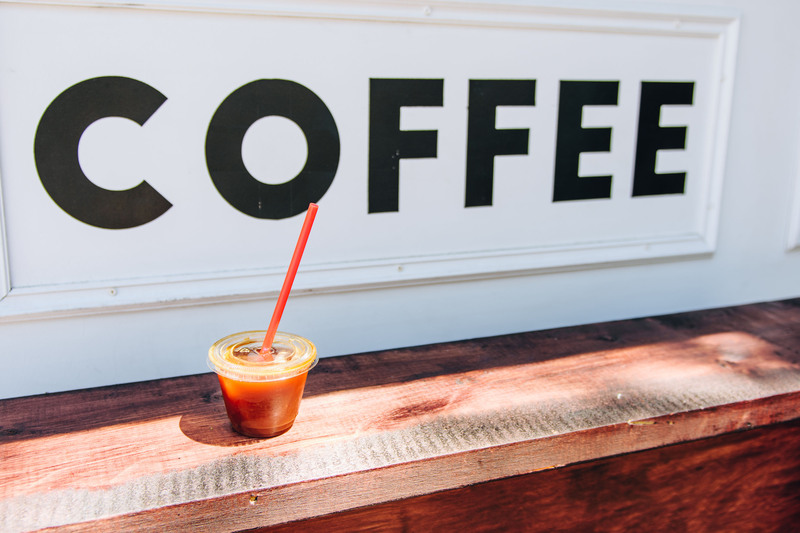 Jamie's tip: The iced coffee with milk from the bike-thru window is certainly the way to go in the heat. Let's say you're on your bike and something goes "Clank!" but you're also over-tired and sleepy from that late night at the office. 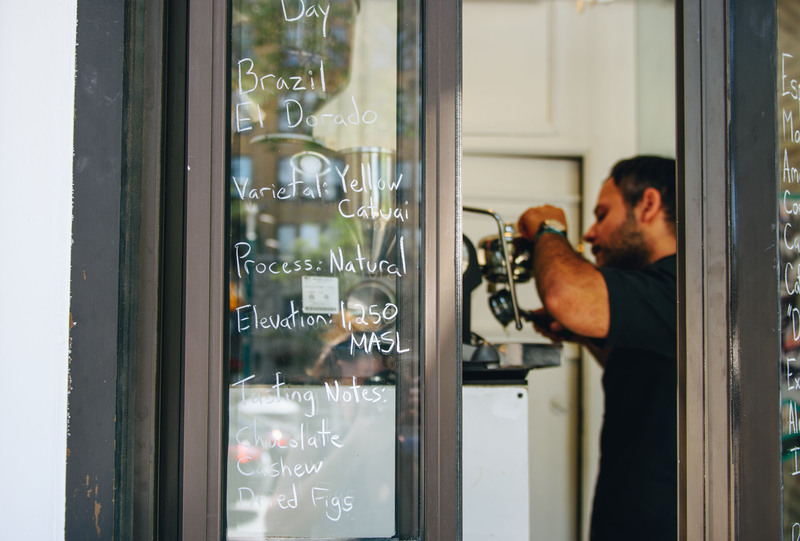 Where should you take it for a quick fix? If you're in the area of Dundas West or West Queen West, there is only one solution and that's Fix, which will meet all your cycling needs as well as all your coffee ones. You can even bring your dog. Brought to life by owner Fred Sztabinski and doubling as a bikeshop/coffeeshop, this beautifully bright space is the perfect spot to grab a tasty flat white or bagel sandwich. If you're really healthy, they even have their own branded fresh-pressed juices. 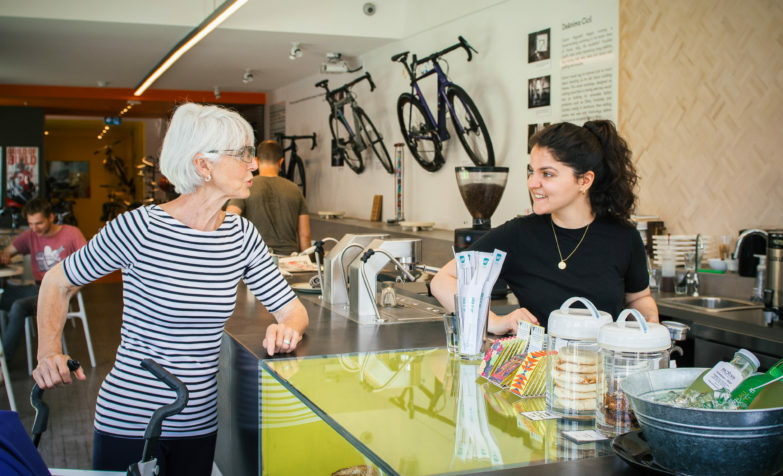 With the spacious outdoor patio painted like a bike lane and a garage showing a custom Toronto bike lane map, you can enter either towards the back which is the bikeshop, or use the front which is more coffeeshop. The most unique part of the structure is the bike-up quickserve window if you really can't bear to dismount from your bike. Inside is part shop, part gallery. 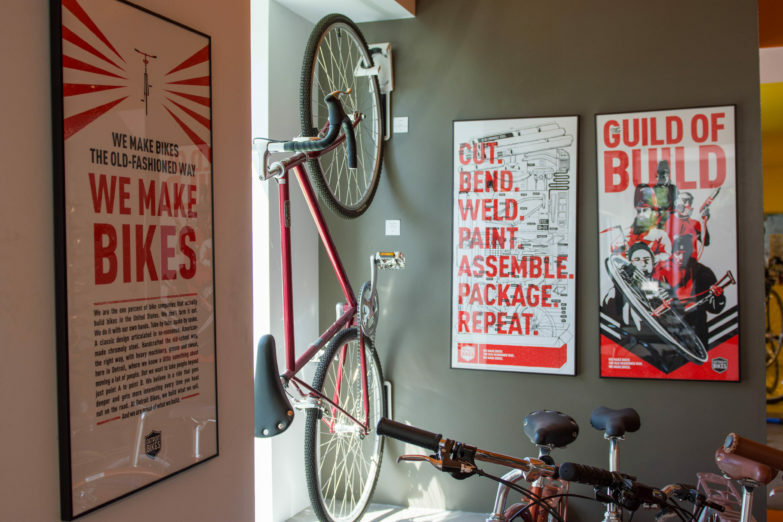 On a rotating basis, they feature a different cycle company or theme to adorn the bleacher walls, often with an interactive "please touch" component. It's popular with the kids who use the bleachers but there's something to admire for everyone. The coffee shop has a small retail section with teas, beans, and mugs and the bike section has a neat selection of rare and unique accessories for your cycle needs like lights, wine carriers, and stylish helmets, as well as Detroit-made bikes, almost local. 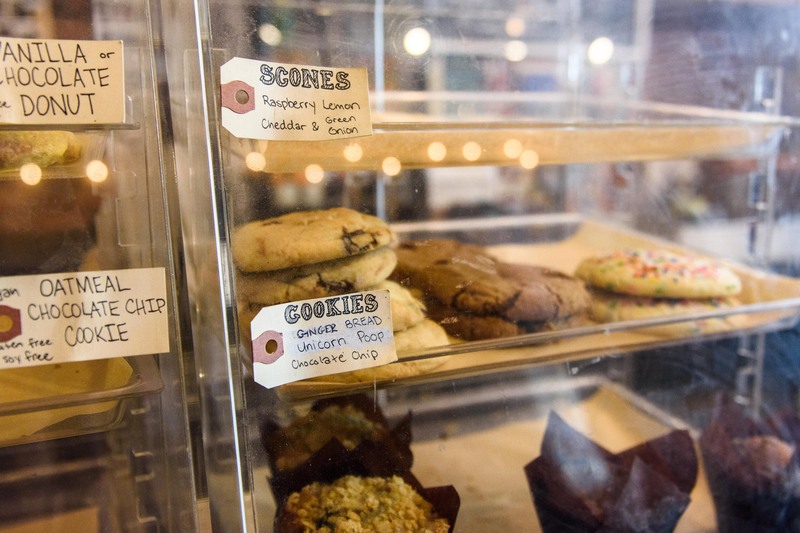 The space, like the impressive menu of drinks and snacks, has something for anyone. 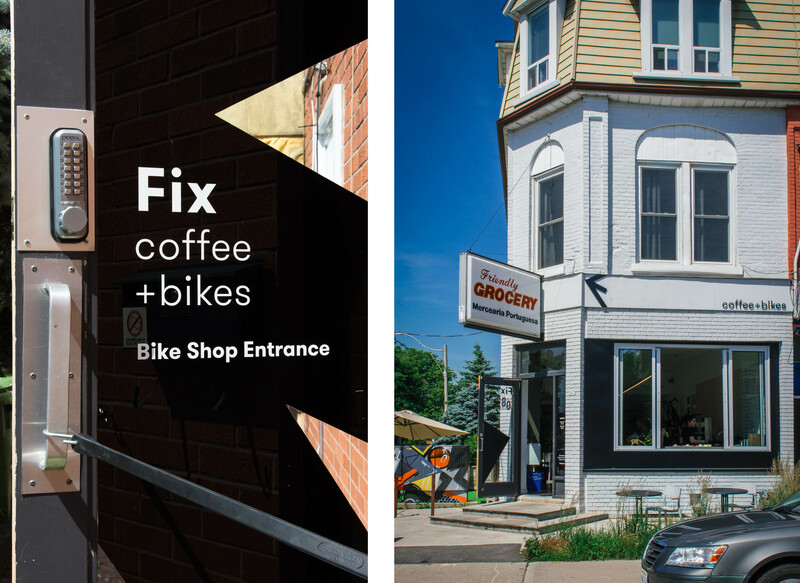 Whether you're popping in for caffeine reload with kids or chilling out to work or stopping by for your bike, Fix has a place for you. 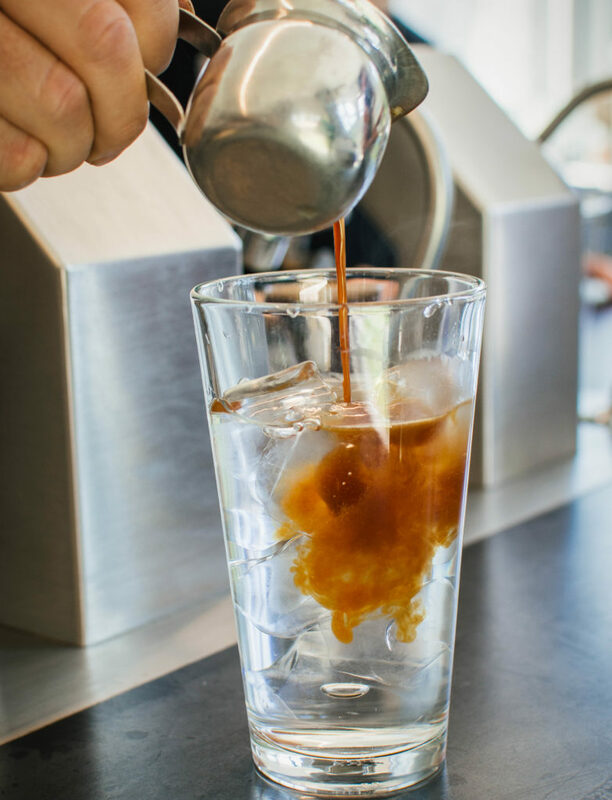 Jamie's tip: For the summer, keep it deceptively simple with an iced Americano made with the beans of the day. 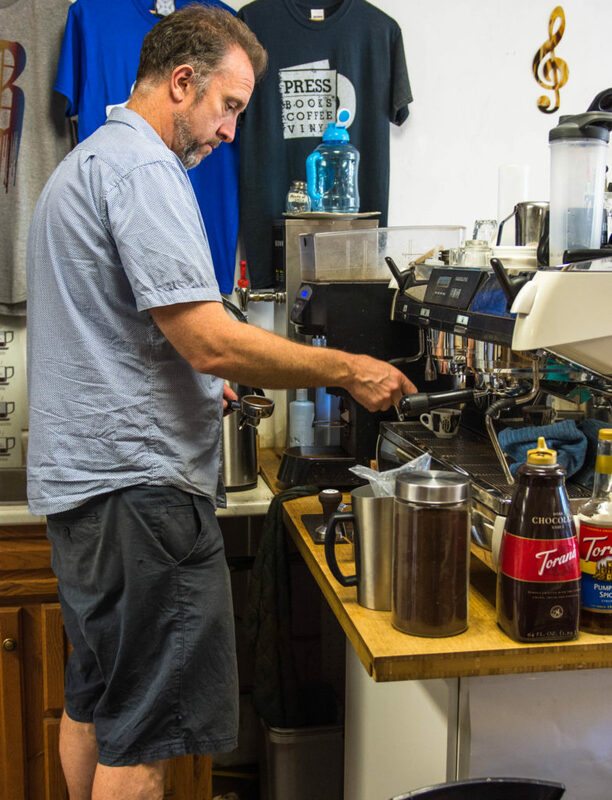 If you've heard about this coffee spot already, it's likely because it has taken top honours as the city's smallest cafe... and arguably the smallest coffeeshop in the entire world at a mere 18 square feet. 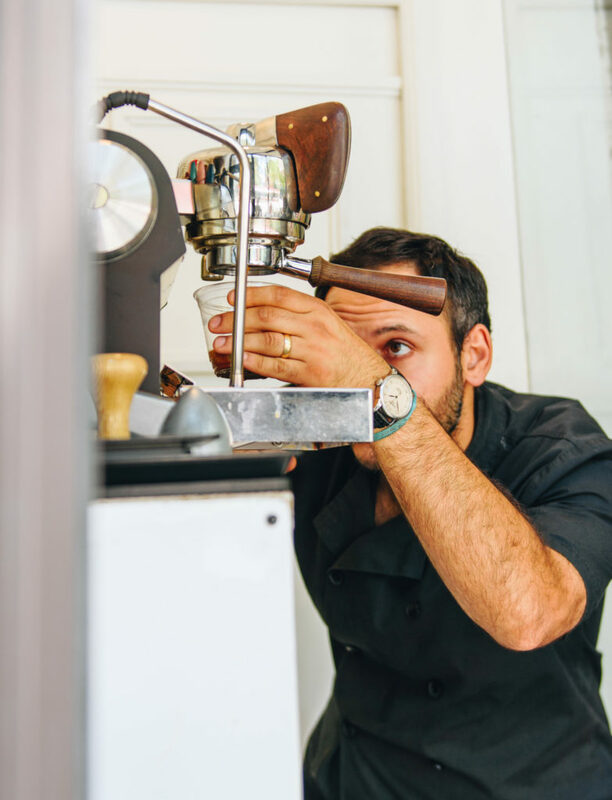 Nestled inside what would normally be a display window for a retail outlet, it's a one man show as owner and barista Joshua Campos carefully operates the press. 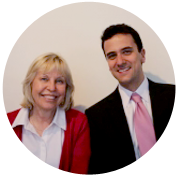 There is no indoor seating; there is barely any outdoor seating. But that's not what people are visiting for. 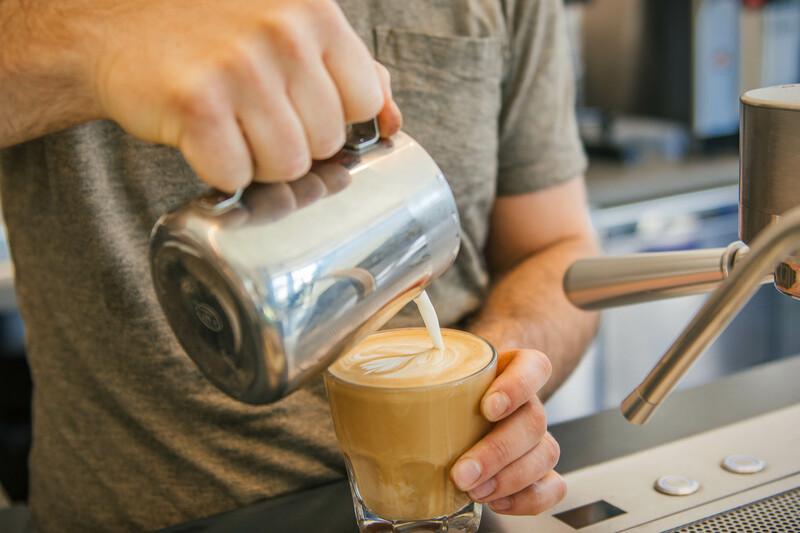 The one reason for The Coffee Lab is, you guessed it, a perfectly-crafted cup of joe, not browsing Facebook while eating avocado toast. 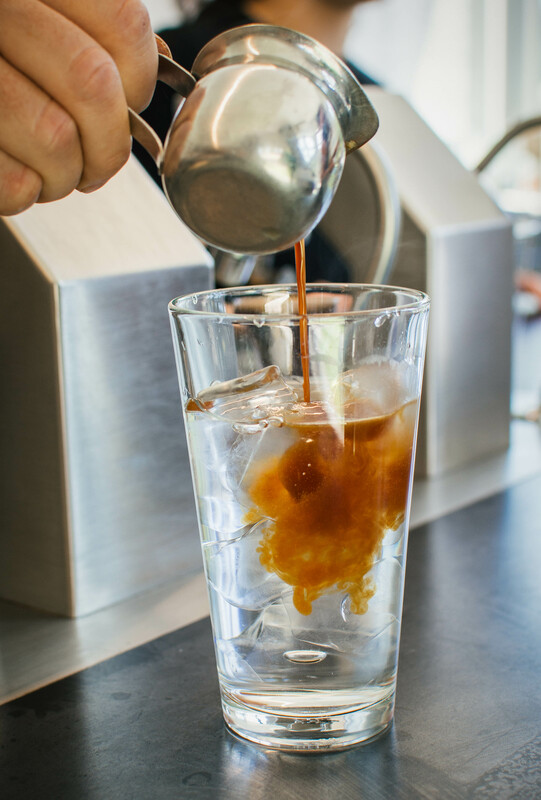 However, if you're willing to stay, you'll be treated to aesthetically pleasing offerings and the very Instagrammable The Drop, a great looking and tasting drink served in a beaker. 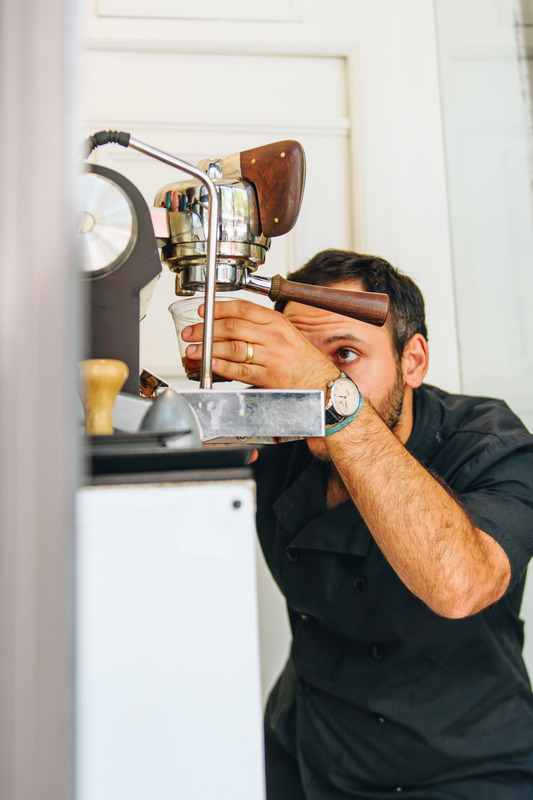 As there is no indoor seating area and the "lab" is basically on the street, you'll have no choice but to watch as your coffee is painstakingly made. 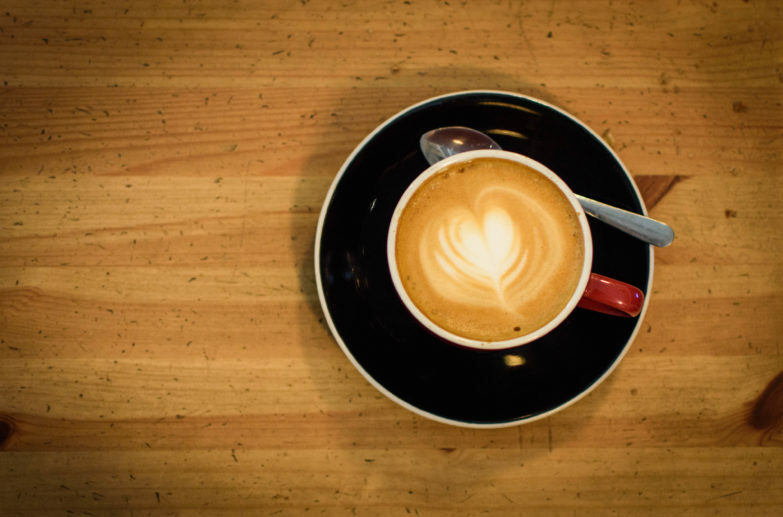 Don't be in a hurry either because each cup is a slowly-brewed work of love. Despite its small size, it has a large following. 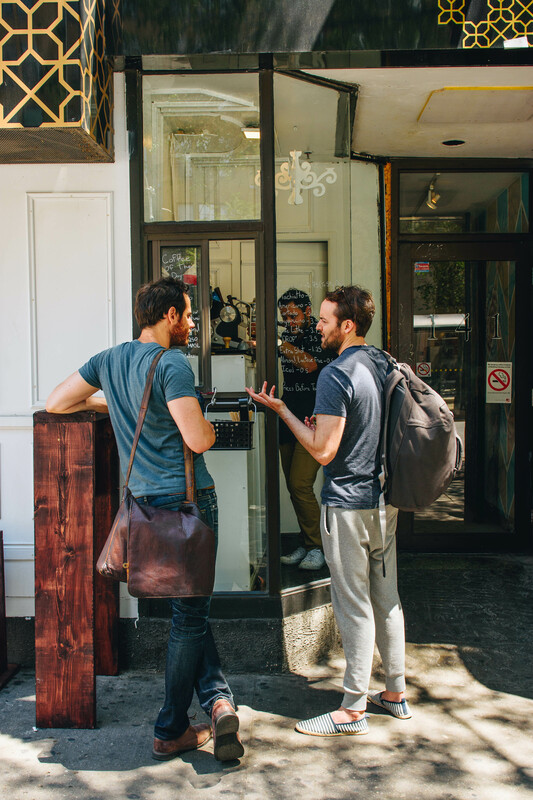 Even just standing in line, you're bound to strike up a conversation with somebody who swears by Joshua's coffee and tastes. They'll probably even give you a recommendation of what to order. So, if you're walking around Spadina and Queen and can't bring yourself to settle for McCafe, walk a little south until you see a big red arrow for pizza. That's where the smallest coffee shop is.